Ability to handle English language as if it is your first language. Good Team player - Able to work independently and well on a team. Caring and no bossy attitude. Willingness to share your knowledge with your colleagues. Passion to excel in whatever you do. Creative thinking and ability to 'think outside the box' are ESSENTIAL. You will be responsible for setting up (over KVM), maintenance and management of Linux based servers and its applications. Monitoring the load, diagnosis and isolation of the reasons. Server Optimization and Security Fixes. Maintaining backups - including twice in a week check to make sure that the backups are running. Developing and maintaining scripts for monitoring and reporting various aspects of system performance, resource utilization, and application usage. Implementing hardware and software alarm system. Installing, optimizing, monitoring web servers, file servers, Database servers, Mail Servers etc. Installation / patching and configuration of Kernel and Software packages. Documentation of each process / tasks done. Minimum 4 years Linux administration experience. Advanced knowledge of Linux OS and must have worked on all major distros. Knowledge of bash and Perl shell scripting. Advance knowledge on Apache, PHP, Sendmail, Exim and MySQL. Experience in building out MySQL clusters and high availability clusters. Able to work in a high pressure 24x7x365 environment. Willingness to learn, teach and be challenged. Ability to work independently, think creatively in order to solve problems, and effectively prioritize and complete tasks with minimal supervision. We are seeking a Senior Technical Support Engineer to join our fast growing company. You will be responsible for providing in-depth technical support to our customers, end users, and support partners. Troubleshooting, diagnosing and resolving technical issues raised by the end users over our client's ticketing system or chat. Write technical articles for the knowledge base. Act as mentor for Level I staff. If you prove yourself to have the managerial abilities, you will be act as supervisor / team leader for a shift/team. Work directly with customers via phone and trouble tickets to resolve hosting service related issues. Participate in the planning of future network services and development of internal applications to accomplish requirements and improve overall efficiency. Min 2 years experience as a technical support engineer. Good knowledge in web servers, NFS, DNS, NIS, MTAs. Nice to have experience with Apache, Litespeed, CentOS, Nagios, Cacti, DNS, hosted services, MySQL, R1soft, Wordpress, cPanel. Good knowledge of network design - Working with Firewalls, DNS, Load Balancers. Prefer some programming experience (particularly Bash, Shell, Perl, Python, PHP, HTML, MySQL). Knowledge of relational databases including a database query language. Strong written communications skills in English language. B.Tech / B.E in Computer Science / IT / ECE. Good knowledge on shell scripting. Certifications like RHCE, CCNA, MCSE, MCP, RHCT etc are preferable. Hands on experience with control panels like cPanel, Plesk, Ensim, H-Sphere, Direct Admin, dotNetPanel etc. Responsible in improving the visibility of the organization and its services which will include, but not limited to idea generation. Maximize profits through advertising, public relations and research. Contributing to organization's blogs and managing media resources. Keeping up to date with current digital trends. End to End execution of marketing projects and campaigns, including creation of collaterals and distribution of collaterals in different online and off line media. Measuring the effectiveness of campaign prior to its implementation. Liaising with web and graphic designers to create visually effective collaterals. Creating and maintaining social networking channels. Execution of Social Media Marketing efforts. Excellent English communication skill is a must (both written and oral). Ability to design and develop collaterals. Be comfortable writing and communicating effectively about technology. Have a strong interest in the future of digital products. We are looking for a PHP Developer responsible for building an end-to end system between the server and the users. You will be responsible for the development of a web application and should be able to do/delegate tasks effectively (Outsource if required). You should have hands on experience in Laravel. Should have a good understanding of micro services incremental approach. Manage the project giving importance to cost and quality. Report to Management with the Project monitoring report and improvement suggestions and documenting the project details. Minimum 1-2 years of hands on experience in PHP development. Strong knowledge of micro services incremental approach. Preferably a B.E./B.Tech graduate in Computer Science or IT. We believe in providing an exciting, challenging and rewarding environment for all staff. Primarily being in service industry, our people are the driving force behind our success. The best man for a job is not the one with the best capabilities but one with the greatest commitment. Never say die! You need to be competent, curious and self-driven to be working at SupportSages – the same high standards of hiring have been applied to every single person at our office. We're looking for smart people who can get things done. During your interview, we're going to look for a few qualities that we know will make you successful here. The best thing about working at SupportSages is having the satisfaction of doing something you love in a place where your coworkers feel exactly the same way. With us, you also have greater control of your earnings!! When you have found your ideal position, you can apply at https://www.supportsages.com/careers or you may also email our HR at hr@supportsages.com. You can apply with your LinkedIn profile as well. You will be shortlisted based on your written English skills and technical skill set. Your non-academic achievements are also given weightage. Rejected candidates won't be notified, sorry for that. Unless you are a candidate with experience, the above short listing process won't have a major impact on the HR's decision to give you a call telling about the dates. On the interview date, which can be either telephonic or face-to-face, you will be evaluated for your role-related knowledge. For experienced candidates, we will be interested in how you think. We will also want to know how you've flexed different muscles in different situations in your life. PS : We are tough on the trainees and freshers. Passion cannot come without some knowledge around it. So during the three months training period, you develop a passion for your job or quit! Once your training period is over, you would have made yourself a better person. Our HR staff, review your performance on all the three phases and determine whether you are right for the position. If we think you have that something special, we forward your details through to the hiring manager who will decide on the candidates he think have the personality, experience and the potential to be a great fit with 'The Sages Guild'. You may have a final interview with the Management before moving to the next step. In the interview, you will be checked for your team player skills, your inter personal skills, your technical skills or even it could turn up to be a stress testing situation. At this stage, we would need some references from you. It could be a professor, school teacher, your family friend or anyone who can vouch for you as a person. There may be third party verification also. If you are offered a position, you will be asked to sign an employment contract, and if you agree to the conditions in the contract, you can get started! 8. Hired. You are now a Sage!! SupportSages Consultancy Services Pvt Ltd announces Internship and Industrial Training Programs for the students of BE,B.Tech and MCA. SupportSages is a well-known entity in remote IT infrastructure management and Administration industry and are currently rapidly expanding both vertically and horizontally. The process of finding the right talent and nurturing them to a capable system administrator have been the backbone of SupportSages’ past success story. Since we follow our strict measures in selecting candidates with the highest technical qualifications (not educational, we even have employees who are drop outs) and attitude, many students/aspirants are not getting a chance to be part of this great organization. Keeping this situation in mind and as part of SupportSages’ CSR activities, SupportSages have planned to introduce a new internship/industrial training program for Free of cost to few deserving candidates. The training programs are offered to the students of Computer Science, Information Technology and other streams of engineering/ MCA and in the areas of Linux, Server Administration, DevOps and Other technologies related to Linux and Server Management industry. The duration of the internship/industrial training will be for 8 weeks, and there will be periodic evaluations happening at the end of every week. The interns will get a chance to learn and apply the latest trends in the technology. Subgroups of interns will be allotted a mentor from our core technical team and they will be helping the interns to complete on-the-job tasks with some live projects. During the periodic evaluations, if the intern is not performing up to the standards, he/she may be let go from the program. Educational qualification is not a benchmark for the right candidate, however we prefer candidates who are B.E/B.Tech or MCA graduates. SupportSages believe that if your communication skills are not good, then you may not be able to execute your ideas effectively in this customer centric field. So there will be a written English language test as part of the initial screening. 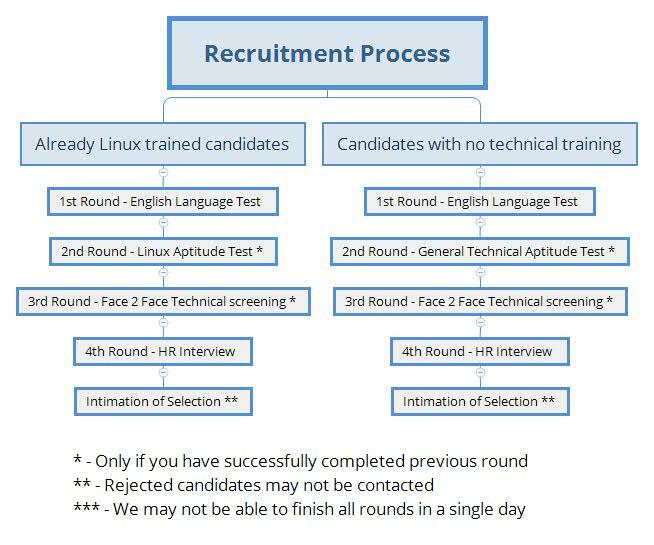 Candidates who have cleared the language tests may have to undergo a basic technical test as well and the final list of interns will be selected based on the basis of these tests. We may conduct a one-on-one discussion if required. We are limiting the internship program for 15 candidates in a batch. Currently planning for 2 batches of 15 candidates each. SupportSages offices at Edappally Toll, Ernakulam. Email your resumes to hr@supportsages.com with Subject ‘Application for Internship Program -2018’ or visit our website and submit your application through Career Page.